Much has been written about the consumerization of IT, the movement fueling many SaaS startup’s growth by targeting individuals in a target customer called B2C2B, rather than selling top down. But until yesterday, I hadn’t found anyone who had quantified the size of the movement. In mid-2014, CEB published Harnessing Business-Led IT to answer this question. While the entire report is worth reading, the chart above answers the particular question above. Just how big is B2C2B? About 30% of IT spend. 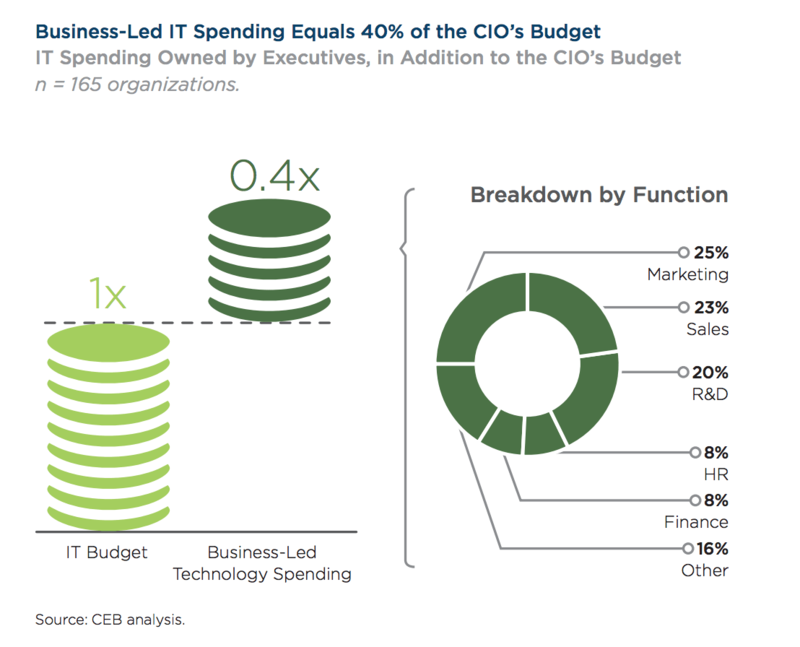 In their research, CEB discovered that for every dollar of IT spend, another 40 cents are spent by line of business owners buying software directly. In addition, the data illustrates this pattern of software purchasing spans most of the key departments within a company. While sales and marketing top the list, finance, engineering and HR also buy software this way. As the report indicates, IT purchasing occurs across four categories spanning departments: process automation, collaboration, analytics and customer interface, with B2C2B companies most typically addressing the last three. Depending on the department, CEB estimates bottoms up purchasing represents anywhere from 36 to 72% of a department’s total spend. Without longitudinal data, we can’t conclude much about the pace of change in this trend. But the growth of the many B2C2B SaaS companies is a strong indicator that at some point in the next few years, more than half of software will be purchased bottoms up. This is a fundamental shift. It’s an shot across the bow, a battle cry, a bugle call to the incumbents that they there are startups at their customers’ front doors bearing gifts.